This genus is accepted, and its native range is Europe to Caucasus, Medit. to Ethiopia. Perennial. 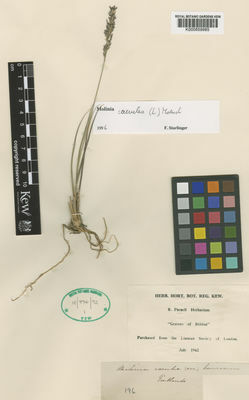 Rhizomes absent (1), or short (1). Culms erect; 15-71.25-120 cm long. Ligule a fringe of hairs. Leaf-blades deciduous at the ligule. Inflorescence a panicle. 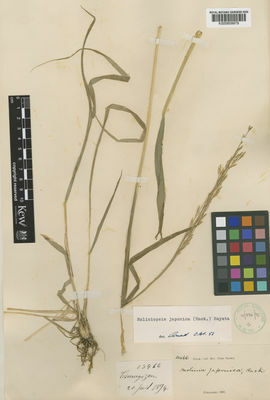 Panicle open, or contracted (1). Spikelets solitary. Fertile spikelets pedicelled. Spikelets comprising 1 fertile florets (1), or 2-4 fertile florets, or 5-6 fertile florets (1); with diminished florets at the apex. Spikelets lanceolate, or elliptic (1), or oblong (1); laterally compressed; 4-9-15 mm long; breaking up at maturity; disarticulating below each fertile floret. Floret callus glabrous (1), or bearded (1); truncate (1), or obtuse (1). Glumes persistent; shorter than spikelet. Lower glume lanceolate (1), or ovate; 0.6-0.8375-1 length of upper glume; membranous; without keels (1), or 1-keeled (1); 0-1 -veined (1), or 3 -veined (1). Lower glume lateral veins absent (1), or distinct (1). Lower glume apex acute. Upper glume lanceolate (1), or ovate; 0.66-0.6825-0.75 length of adjacent fertile lemma; membranous; without keels (1), or 1-keeled (1); 1-2 -veined (1), or 3 -veined. Upper glume apex acute. Fertile lemma lanceolate (1), or ovate; lanceolate in profile (1/1), or oblong in profile (1/1); membranous; without keel; 3 -veined, or 4-5 -veined (1). Lemma apex obtuse (1), or acute. Palea 1 length of lemma; 2 -veined. Palea keels smooth (1), or scaberulous (1). Apical sterile florets resembling fertile though underdeveloped. Caryopsis with tardily free pericarp (1/1); obovoid (1/1). Embryo 0.33 length of caryopsis. Hilum linear (1/1); 1 length of caryopsis. Europe (1), or Africa (1), or Temperate Asia, or North America (1).